There are no other hands or hearts to do the work of justice. It’s up to us. Core to our faith and congregation is being involved in making the world more just. Partnering with other organizations in Northern Colorado we aim to build long-term, sustainable relationships in which we struggle together unleash courageous love. 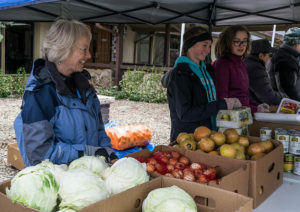 Twice a month we host a mobile food pantry in partnership with the Food Bank of Larimer County that distributes groceries donated from local grocery stores and food stores to those in need. Volunteers of all ages join together to help address food insecurity in Fort Collins. Faith Family Hospitality (FFH) is an interfaith ministry to families experiencing homelessness in northern Colorado. Each week during the year different congregations provide overnight shelter, meals, and hospitality to an average of 14 children and adults. Foothills is a founding member of this collaboration and hosts four times a year. 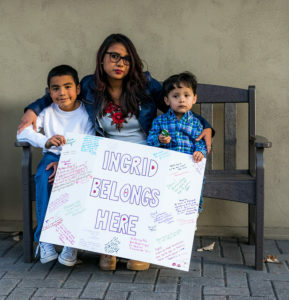 In partnership with Homeward Alliance, Foothills members form “villages” that accompany families experiencing homelessness into stable and secure housing. Our villages each support a family for at least six months, offering assistance in budgeting, accessing community resources, and moral support – often their greatest need. 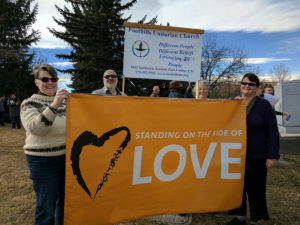 Foothills is a Sanctuary congregation committed to being a safe haven for those threatened by deportation and to be in solidarity with our immigrant neighbours. From an organic garden on our campus to helping construct a solar farm, we support many environmental causes. The Climate Justice group hosts panels, discussions, workshops, and other events throughout the year. Foothills is increasingly integrating climate action into the entire fabric of the church. 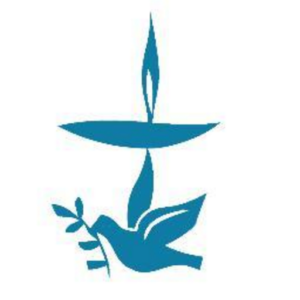 Established in 2010 to “…affirm the equality, dignity, freedom, and security of all people involved [in the Israeli-Palestinian conflict]” our UUs for Justice in the Middle East educates and advocates for an end to the conflict in the middle east. Each Sunday we collect an offering that we share equally with a partner that shares our mission of unleashing courageous love. We do this because investing in the transformation of Northern Colorado is not optional in our faith, but essential. Our Foothills community generously supports our partners and financially supports our entire operation. Submit for consideration a local nonprofit organization doing their part to unleash courageous love in Northern Colorado and Beyond.